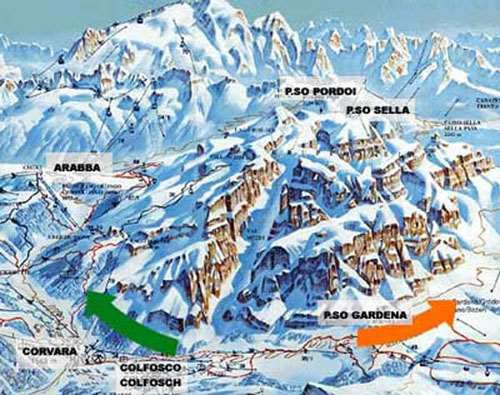 Found in the Alta Badia ski area and a linked offshoot of the Sella Ronda circuit, Corvara is one of the bigger villages. It is also one of the more lively. There are lots of restaurants, bars and hotels. 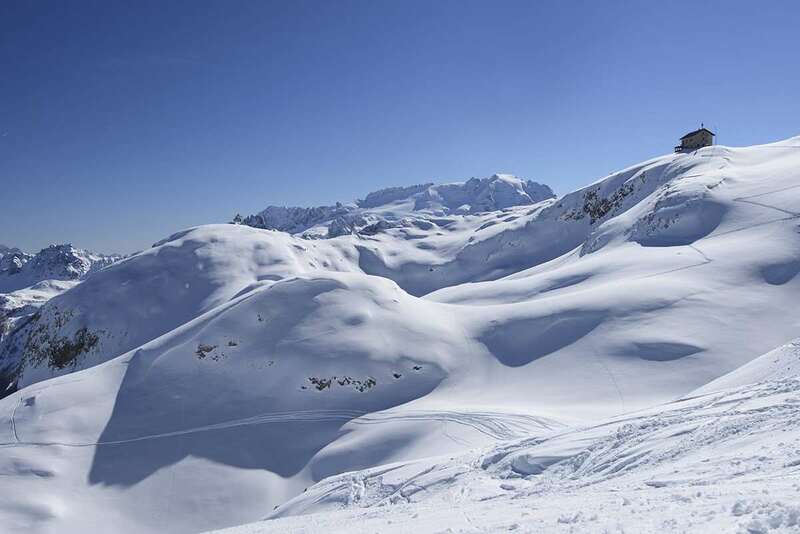 The resort is very conveniently positioned to get the most out of the region's skiing, much of which favours intermediate cruisers and beginners. Experts may well want to stay in nearby Val Gardena for some of best tough stuff in the Italian Alps. The ski school is based right in the town with the nursery slopes directly outside, underneath the ‘Boe’ gondola. From here you can quickly progress onto the gentler slopes leading back into Corvara town. A mixture of wide pistes above the tree line, beautiful wooded cruisey runs back to resort makes the area particularly suited to intermediate boarders who want to see as much of the area as possible. Going off piste with a guide, the area is as extreme as you want it to be. High altitude skiing rarely dipping below 1500m and a good snow record means very reliable snow conditions. Friendly yet chic, Corvara is an ideal winter retreat for both skiers and non skiers alike. A resort with a real buzz, so many fines wines to taste, so many treatments to enjoy, cakes to eat, even the keenest skiers will find it hard to drag themselves away from the hotels and make it onto the slopes. At the end of a days skiing there really is a complete range of options to enjoy from a quiet aperitivo right through to the infamous boot bop and its even more infamous champagne cocktails. The ski school has a dedicated area for younger kids directly outside the ski school office with a magic carpet lift, separated from the main piste. Children can attend ski school from 4 years. Bolzano is the nearest airport to Corvara around 63 km transfer away. Other airports which are also convenient but a lot longer transfer times are Innsbruck, Treviso, Marco Polo, Verona, Gabriele D'Annunzio and Orio al Serio. Our first time visit to the Alta Badia and we were blown away by the landscape. The skiing is varied and allows you to go to different villages in the area without having to use transport. Lovely and friendly people and Hotel and food were outstanding. Would certainly go back.